It was close to midnight when the United National Party (UNP) Deputy Leader, Karu Jayasuriya, walked into a small room (10 feet X 8 feet), in an old house. His political chores for Saturday October 30 had just ended. He shut the half door that remained open. Already locked to the frame was the other half. With his thumb, he pushed upwards the lever of a creaky old power switch on the wall. A light bulb without a shade that hung from the roof went off plunging the room into darkness. He thrust himself on a wooden bed made of a jute mattress stuffed with coconut fibre. A crisp, coloured and new bed cover hid it. The two pillowcases were new too. The only other piece of furniture in the room was an old table. A small radio lay on top. Outside the door, M.A. Piyasena, rolled out a mat and slept on a pillow after saying Budhu Saranai (Buddha's blessings) to his VIP guest. He seemed to have taken over the role of personal protection from the only police officer who escorted Jayasuriya. He had to sleep a distance away securing his revolver. Soon all were fast asleep. Known better as Piyasena Aiya, he is a retired minor employee of the Ceylon Electricity Board (CEB). His abode in Wewela in the outskirts of Horana (34 kilometres southeast of Colombo) was home for Jayasuriya for one night. The lower middle class family was so poor, they had to borrow the bedsheet and the pillow covers from an affluent politician in the area. It was returned to the owner later. At 5.a.m. when Jayasuriya woke up, Piyasena greeted him at the door with his hands clasped together saying "Subha Udasanak" (Good Morning). A brief conversation ensued. Jayasuriya said he rested well. His host, however, was to confess that he woke up around 3.30 a.m. In turn, he had then woken up a family member in the household to tell him not to forget to go over to a neighbour's house at 5 a.m. to collect fresh milk. There was a herd of cattle there. Jayasuriya used a toilet outside the house and walked to a well further away for his morning ablutions. A helper drew buckets of water with a long rope. More members of the Piyasena family had arrived. They helped his three daughters put together a breakfast of kiribath, pol rotti and hoppers with accompaniments. Piyasena told Jayasuriya a 76-year-old female neighbour, a staunch party supporter, wished that the deputy leader visited her. She was down with cancer. He went there and the woman said one of her sons was a police officer while the other was in remand prison custody. She had only one wish - that Jayasuriya visits her one more time. That is when she is dead. He nodded politely to say he would. He was quick to add that his wish was that she should live longer. That was one night in the life of Karunaratne Jayasuriya (69), the second in line of command for the country's main opposition political party, the UNP. The occasion was the launch of Grama Charika (Village Tours), his brainchild and the party's new venture to win back grassroots level support. Such a project was coming just ahead of a testing time, the local councils elections next year. This new experiment, no doubt, is unique and unprecedented somewhat in the party's history, though party leaders going to rural areas and camping out is not entirely new, but became a lost art in recent times. Not so long ago, the UNP projected itself as a party that kept pace with the new technological advances sweeping the world. On political platforms, particularly during elections, its leaders waxed eloquent on ushering Sri Lanka into an era where all sections of society would be sharing the cyber revolution with computerisation in many fields. In 2004, then UNPer Rajitha Senaratne (now Minister of Fisheries in the UPFA cabinet), vowed to produce"Mod Goviyas" (Modern farmers) who would wear denim trousers, T-shirts and use high tech methods to multiply their yields. As a UNPer he then visualised a push button era. Barring a few who have turned to tractors, the farmers still use buffaloes to till their fields, and the Mod Goviya concept was ridiculed by those who are now his Cabinet colleagues. What the UNP envisioned is indeed taking place, but slowly as probably the 'amude' (loin cloth) wearing farmer is less in number, but a technological revolution in farming is yet to be seen. Now, for the oldest albeit the premier political party, only its own goals appear to have changed. Instead of taking them to a new world, its leaders are going back to the common person's own world. That is the lesson from Jayasuriya's night out at Piyasena's household. If the new experiment is to win hearts and minds at the village level, shedding their own lifestyles to share those of the poorer sections of society for selected nights, danger lurks for the UNP. Its aim to become a formidable force to President Mahinda Rajapaksa's administration could well see a grassroots level splintering of the grand old party. Reasons are many. Some key elements of the Grama Charika programme firszt. That Saturday began when Jayasuriya joined 14 other UNP parliamentarians to visit temples in Horana. They held pocket meetings in different areas, some extending until midnight. Parliamentarians broke into groups for this purpose. Others took part in peduru parties (parties where seating is on mats) and music, particularly baila and Sinhala golden oldies found some prominence. An eye clinic followed lunch. They ate on lotus leaves at the Horana Lama Udyanaya to show they could do it the rural way without forks, knives and spoons. For good measure, Jayasuriya ignored the rice, and a variety of curries to choose boiled manioc and ground red chillies. The night was more formal when a caterer served a buffet dinner for professionals at the Arambekanda Hotel in Horana. Like Jayasuriya, only a few of the MPs chose to stay with party supporters. Most returned to Colombo for the night. One of the novelties to the rural event was the distribution among participants of a pack containing printed material on the Grama Charika, note pads and a green cap emblazoned Grama Charika. It cost money. The next day, MPs undertook a programme to visit 40 more temples in the area and speak to members of the Buddhist clergy. Others talked to trade unionists living in the area. A membership drive followed. UNP leader Ranil Wickremesinghe joined the programme by attending a lunch with some 300 others at an open area along the Gonapola Road. This was more formal and there were ceramic plates and not lotus leaves. His deputy, Jayasuriya was at a different lunch engagement at Handapangoda. Groups also visited party members who had remained estranged since this year's presidential election. Compiled ahead of the event were lists of such persons together with their addresses. They pleaded with them to return to the party. After an event where free spectacles were distributed, the tour ended with participants signing a petition seeking the release of former General Sarath Fonseka. There was also a Bodhi Pooja (homage to the sacred Bo tree) for this purpose at the Raja Maha Vihare in Horana. The first Grama Charika programme drew little or no interest among supporters of other political parties in the area, particularly those backing the government. It was no irritant. Nor did it lead to any extra security measures by the local police. The only distraction, significant enough, came from within the UNP. Just two days ahead of the event, Sajith Premadasa, who is demanding immediate reforms in the party, held his own parallel events. Though he was a member of the UNP Committee that had formulated modalities for the Grama Charika programme, later approved unanimously by the Working Committee, Premadasa launched one of his own parallel projects. At first, he named it the Grama Sangwardena Charika (Village Development Tour). It was to draw some criticism from members of his faction within the UNP. They were to point out that Grama Sangwardena or village development programmes were a title that would be appropriate only if the party was in power. The name was changed to Udagam Charika (Re-awakening of Villages Tours), a project that neither UNP factions opposed to nor backing him could protest. It was similar to Sajith's late father, Ranasinghe Premadasa's Gam Udawa (Village Re-awakening) programme that led to the construction of housing townships countrywide. On October 28, just two days ahead of the Grama Charika, posters about young Premadasa's Udagam Charika were plastered in most public places in the Horana area. He visited three housing townships including Maugama and Arunagama which his late father set up. Joining him were Ravi Jayawardena, the UNP organiser of the area and D.P. Abeyratne, a member of the Western Provincial Council. The latter was a staunch supporter of the late Ranasinghe Premadasa. The events were to trigger speculation that Premadasa was to boycott the Grama Charika programme. Both Jayawardena and Abeyratne told UNP leaders they had taken part in Premadasa's programme on the understanding that he would attend the party's own event on October 30 and 31. This raised hopes that Premadasa would be present. In fact, Premadasa told the Sunday Times last week "The media have concocted a different story that I am on a different path from the UNP. I am with the Grama Charika progamme formulated by the party to go to the villages. I am a politician who has championed this cause. On Thursday (October 28) I was in Horana where I visited three model villages built by my father. I am more of a part of the UNP than the newcomers to the party. "I will be attending the meeting (Grama Charika rally at Horana) on Sunday. I have also started a programme "Sasunata Aruna" as a prelude to the 2600 Sambuddha Jayanthi next year. We are giving Rs 50,000 to the needy temples for their development work and two of the beneficiaries so far have been Maugama Batuwita Temple, which is in my grandmother's village and the Arunagama temple. While on Sunday too I will be assisting two other temples in the same area namely the Pelpitigoda Nandarama Viharaya and the Nimalagama Sri Madura Sama Viharaya." Within just two days, Premadasa changed his mind. Despite blaming the media for "concocting stories" to the contrary, Premadasa did not take part in the Grama Charika programme. Perhaps the only complaint his party could have against him is the fact that he is pushing ahead with his own parallel programme. This is while not taking part in a project approved by both him and the party's main policy-making body, the Working Committee. The fact that he is doing so simultaneously on the same terrain where official party activity is under way has not only come as a formidable challenge to the UNP leadership, it has also pitted Jayasuriya, spearheading the Grama Charika drive against Premadasa, once an ambitious aspirant to the leadership, and later to the deputy leadership. In another development, Premadasa has also locked horns with his arch rival Ravi Karunanayake (UNP-Colombo District). In a bitter attack on Sajith's father, Karunanayake said that the separatist war would have ended much earlier if the late President Ranasinghe Premadasa did not provide arms to the Tiger guerrillas. Sajith Premadasa hit back. He said Karunanayake had ridiculed the victories of the armed forces. He had rhymed the re-capture of Alimankada (Elephant Pass) to Pamankada (a suburb in south Colombo). Thus, at least temporarily, the crisis for Wickremesinghe, the party leader has lessened or almost disappeared. Months earlier, he was the focal point of much criticism. That paved the way for a UNP Reforms Committee recommending changes to the party constitution. Resultantly, another committee has already formulated a draft, now due for formal approval at a Working Committee meeting this month. Thereafter, it is due for endorsement by the annual sessions of the party in December. In the interim, attention has shifted away from Wickrmesinghe. The others are now fighting it out. It became glaring last Sunday where both Wickremesinghe and Premadasa were in Ingiriya in Horana. The former was engaged in Grama Charika and the latter making a Rs 50,000 donation to two different temples. At least in one temple in Horana, the chief incumbent, a staunch supporter of the UNP, refused to accept the money saying Premadasa should first settle his differences with the party and unite. However, Premadasa continued influencing temples and winning friends in the Buddhist clergy through his generous donation campaign. Much to the chagrin of his rivals who complained that only months earlier, electricity and telephone bills at Siri Kotha, the UNP headquarters, remained unpaid. Herein lies the biggest danger to the UNP. The internecine crisis, which centred at the leadership level, was a fact that was known mostly among the upper echelons of the hierarchy and those close to them. The village-level party leaders were largely not privy to the resultant interplay and their nuances. By what appears to be his parallel campaign, Premadasa is successfully carrying to xxthe grassroots the message that the UNP is deeply divided. He wants to thrust himself to supremacy and overshadow his own party leadership, say his critics. This is not without some validity. He is seizing on the popularity of his late father, whose strongpoint was the immense grassroots level support he enjoyed as a common man himself. A significant volume of this support has come Sajith Premadasa's way. Added to this is the spin off support from those who opposed Wickremesinghe's leadership or were critical of him. There were also those who viewed Jayasuriya as a party deserter who joined the government and later returned to its fold to retain his 'plum position' in the party. This turn of events has naturally been the talking point in discerning government circles as well as sections of the Colombo based diplomatic community. As one western diplomat noted, "this seems good not only for Sajith Premadasa. President Rajapaksa need not launch a campaign for the local polls. It is already being done." A government minister was even more vocal. "They are going in different ways. Sooner than later, the party, now split at the top will continue to be divided at lower levels," he said. They could only become a "useless, no person's party," he added punning on the acronym UNP. A critical question in the recent developments involving Sajith Premadasa is how he was receiving money to donate to temples and carry on an expensive parallel campaign. His loyalists claim they were donations from well wishers both in Sri Lanka and abroad. However, a paradoxical situation has developed with sections in the UNP, opposed to Premadasa, claiming that wealthy business persons supporting the government were funding him to wreck the UNP. His loyalists, however, deny this. The Sunday Times has learnt that some state agencies have launched their own investigations to ascertain whether other sources, including those from abroad, were involved in channelling funds. On Wednesday, just two days ahead of the second Grama Charika in Matara, Sajith Premadasa visited the surrounding towns of Hakmana, Dickwella and Weligama. He had meetings there. The move angered Mangala Samaraweera, the UNP Matara District parliamentarian and former Minister in the UPFA government. He sent out a warning to party branches in those towns that those engaging in Premadasa's programme, ignoring the party's own Grama Charika would not be considered for nominations for the upcoming local councils elections. Thus, a new confrontation is looming between Samaraweera and Premadasa as well. The Grama Charika programme began in Matara yesterday with religious ceremonies in temples, mosques and kovils. 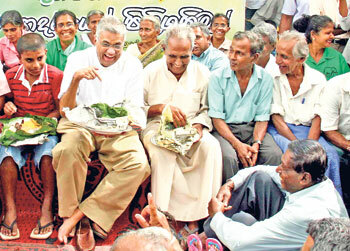 A field lunch was held at an open space in Kekanadura and five different propaganda meetings followed. Today, Wickremesinghe will take part in a lunch at the Verala Udyanaya in Matara. He will later chair a meeting of what is called the Ekadipathi Viyaruwata Erehi Janatha Sammanthranaya (a seminar against dictatorial rule) at the Uyanwatte stadium. Like at Horana, the events will end with the signing of a petition and Bodhi Pooja for the release of Sarath Fonseka. On Thursday, Wickremesinghe led a three-man team to visit Fonseka at the Welikade prison. The others were Karu Jayasuriya and the party's General Secretary Tissa Attanayake. Wickremesinghe was to brief Fonseka on the action he took during his European visit last month to secure his release from jail. He said the signature campaign and Bodhi Poojas would be continued during the Grama Charika programmes. The next will be held in Kundasale in the Kandy District on November 20 and 21. In view of the budget debate in Parliament thereafter, the fourth Grama Charika will take place about a month later at Panduwasnuwara (Kurunegala District) on December 18 and 19. Bodhi Poojas, now incorporated into the Grama Charika programme. The UNP has also reacted cautiously in supporting the ongoing campaign by the Inter University Students' Federation (IUSF), widely regarded as having close links with the JVP. Deputy leader, Karu Jayasuriya visited the IUSF leader, Udul Premaratne, at the Welikade prison where he is in remand custody. However, UNP sources said the party did not condone some of the actions of the IUSF. Officially, the JVP has now disowned the IUSF. "The IUSF is not affiliated to the JVP,' claimed Sunil Handunetti, one of its frontline parliamentarians. He told the Sunday Times "We deny that the Inter University Students Federation is backed by the JVP. We are a party which is working openly and our student movement is known as the Socialist Student Union." The number of university students in custody has risen to 30 while 205 students are under suspension. The UNP and JVP responses came as state security agencies reported plans by the DNA to stage a mass protest in Colombo against what it calls suppression of student rights. "The suppression of the students today will be directed against the public tomorrow. Therefore, the people should rally round to campaign against the suppression irrespective of political party differences," Handunetti said. He added, "We are trying to gather support for the campaign and meet the challenge in a strong manner." Concerns of the security authorities have been raised by fears that the protests in Colombo would be held on November 18, just a day ahead of elaborate ceremonies opposite the Presidential Secretariat on the next day. Plans are said to be afoot to muster a large crowd on this day. On November 19, the swearing-in of President Mahinda Rajapaksa for a second term as President gets under way. Troops and Police to be deployed for security are to be ordered to take a tough stand against those resorting to violence, particularly university students. After the Cabinet meeting last Wednesday, government spokesperson and Media Minister, Keheliya Rambukwella warned that university students were plotting another insurgency. True or not, the remarks only underscore the preparations of the security forces and the police for a trouble free week during celebrations and the presentation of the budget. These events are to be followed by the visit of Indian Foreign Minister, S.M. Krishna and later by Pakistan's President, Asif Ali Zardari. Both visits are equally significant in a domestic and regional context. 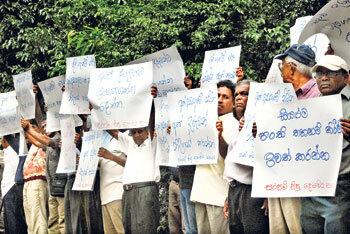 The DNA's focus on the travails of university students has shifted the spotlight considerably from the Fonseka issue. Barring visits by DNA leaders to the Welikada prison, the only other visible activity is from the UNP, and this too is confined to the petition campaign and Bodhi Poojas. The only factor keeping the Fonseka issue in the limelight now is the resultant publicity from the number of cases in Hulftsdorp. However, a much bigger issue for the UNP now is the deepening internal threats it faces. If a leadership crisis placed the leadership at loggerheads, sooner than later, it will extend to the leadership at the grassroots level. Thus, it is the party's internal crisis that will undo the Grama Charika without serving the mass mobilisation programme it envisages. The party will have little or no time to carry out the checks and balances in a democracy where the beneficiaries are the public. That is the fate of what was once the premier political party in post independent Sri Lanka. In the country's main opposition party, the leaders are at each other's throats. Is the removal of checkpoints in Colombo enough? Watch out VC is watching you! The Oxford Union invite – trip or trap?